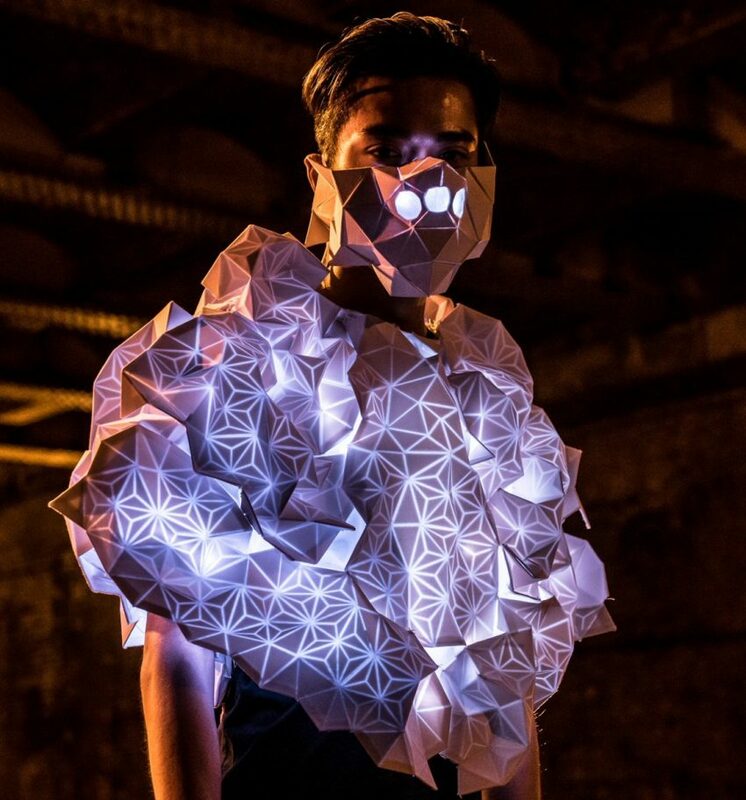 This Fascinating Wearable Tech Reveals Air Quality #WearableWednesday « Adafruit Industries – Makers, hackers, artists, designers and engineers! Kasia Molga will soon premiere her Human Sensor project in Manchester, England according to The Washington Post. The UK artist had a major asthma attack one day and realized the human body was one of the best sensors of air quality. So, she set out to develop art that would visualize the problem for nonprofit Invisible Dust, which matches artists and scientists for collaborative projects on environment and climate change. Kasia was matched with scientist, Frank Kelly, Professor of Environmental Health, King’s College, London. The result is a unique cape and mask which will be worn by a few models in different parts of the city. The outfits are designed to change colors and patterns as the models breathe in and out, and also change in response to the levels of black carbon — a major component of particulate air pollution, often produced by fossil fuel burning and other industrial activities — wherever they happen to be walking. The wearable combines laser-cut recycled acrylic with a textile overlay, giving the cape a cloud-like appearance. In fact, the laser detail resembles the bronchioles of the lungs. It seems like the project had issue with connecting the live data to the LED display, but a solution was found. Organizers will collect pollution data from each location using portable sensors and then program the data into the electronics before the performers go on their walks. “Although it won’t be exactly real time, it’ll be pretty close,” said Andrew Grieve, a senior air quality analyst at King’s College London who has been working on the project. 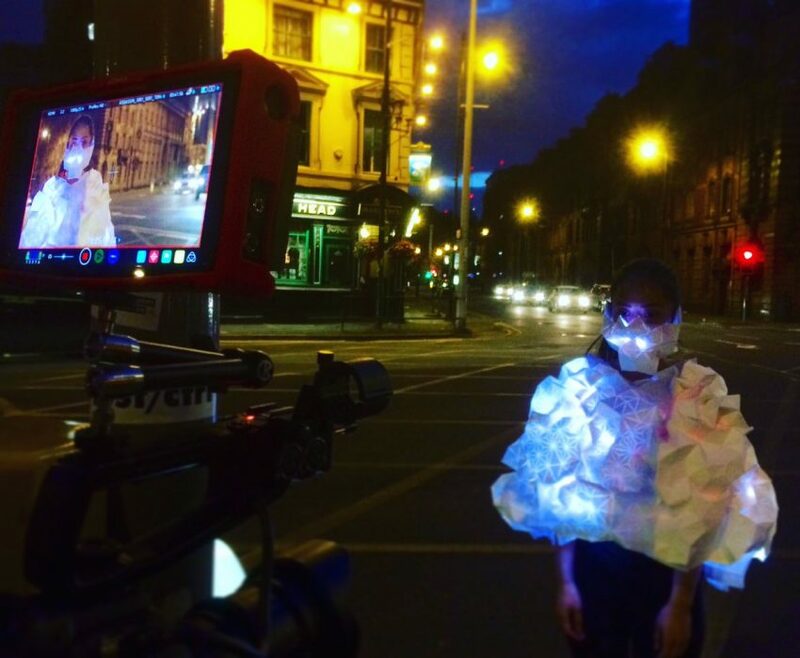 Manchester is certainly going to be in for a surprise with glowing people roaming the streets, and hopefully it will create awareness about air quality. In the SciArt world it is always exciting to make the invisible visible. If you like this idea and would like a good starting project, check out our tutorial for the Fair Weather Friend: Internet Connected Migraine or Allergies Detector. You can turn a simple pill bottle into a device that will let you know when a bad day is coming. You don’t have to check any charts or numbers; just wake up and look for a flashing light. Not only is this a practical application, but it’s a great way to learn how our Feather Huzzah microcontroller can bring you the Internet of Things.